Although trend following has been a popular trading philosophy for many years, surprisingly little has been written about its origins and history. This is partly due, no doubt, to the scarcity of available information prior to the early 20th century, and because until about 50 years ago trend following as a philosophy had not been completely articulated. To be sure, by the early 1950s many trend following methodologies were in common use – and may have been for centuries – but the underlying concept had not been fully defined, or even given a name. One reason for this paucity of early information is suggested by the “following” part of the term “trend following.” The implication is one of passivity, of reaction, rather than of bold, assertive action — and human nature shows a distinct preference for the latter. Also, trend following appears to be too simple an idea to be taken seriously. Indeed, simple ideas can take a very long time to be accepted – think of the concept of a negative number, or of zero: simple to us, but problematic to our ancestors. But for whatever reasons, we learn easily from the past only that which the participants of the time chose to reveal, and above that, what their chroniclers found interesting enough about which to write. We know the stories of the plungers, the manipulators, and their “corners”; of Daniel Drew, Jay Gould, James A. Patten and Arthur Cutten; but little of the lesser known traders, or “followers”, sitting on the sidelines analyzing the markets, perhaps more successfully than their legendary contemporaries. Nevertheless, we are not completely in the dark. There are things to be revealed by looking back into history and giving thought to our topic. Perhaps we should begin by deconstructing our subject. Is trend following one thing, or is it many? Certainly it has – at least today – many manifestations. There are breakout systems, moving average systems, volatility systems, and many others, all of which can be considered to be trend following in nature. But these are the particulars. What are the universals? What is trend following’s basic nature? As a first attempt at definition, I would suggest that trend following has two natures. It is at one level a phenomenon of the human psyche, an expression of the Keynesian “animal spirits” that percolate from the deepest levels of our being. This type of trend following is spontaneous, inductive, adaptive and evolutionary – a burst of conformity to innovations in our immediate environment. At this level the masses have always been trend followers, not only in financial matters, but also in terms of music, art, clothing and basic world-views. But the other level of trend following is something else entirely. This is the metalevel, which sits above the tableau of material and psychological cause and effect, allowing participants to observe the behavior of the markets as a whole – and to design intelligent, premeditated responses to market action. This is the level of trend following from which we as traders should – and usually do — operate. Now, although trend following at this meta-level can certainly become complex, still its essential elements can be simply stated. They are three: 1) to initiate positions based on the perceived direction of the trend, 2) to hold positions based on the perceived direction of the trend, and 3) to liquidate positions based on the perceived direction of the trend. It is also possibly a fourth thing, as suggested above: it is to do all of these things systematically, on the basis of logical relationships or mathematical formulations. But I do not think that this is an absolute requirement. It is certainly possible to be a subjective trend follower, or to combine systematic and subjective elements in a trend following system. In fact, I believe that some great traders did indeed include subjective elements in their methodologies. Here, however, I will focus on the systematic aspect. And here again, the systematic nature of trend following can be simply stated. Generally (though not invariably), trend following systems look for their implementation only at the movement of prices. The basic perception is that if a market’s price is going to make an exceptional move in one direction or another, it must first make a moderate move in that direction, leading to the conclusion that if an initiation can be made at that moderate level, the remaining portion of the trend can be followed for a significant period of time thereafter and liquidated at a profit. This scenario is not always expected to be true, of course; but if it is true often enough, and to a significant degree enough, then it may lead to profitable trading in the long run. As much as we can associate trend following with human nature, we do not know who the first trend followers were. But if we have no known beginning, we must create one. We can say something about a part of trend following. Specifically, of the three elements of trend following mentioned above — initiation, holding, and liquidation – it is the middle part, “staying with the trend” that has had a reasonably long pedigree. A number of the speculators and plungers of the past, when asked about their trading strategies, said that they held on to their positions as long as possible, i.e., they stayed with the trend. As one example, consider the economist and trader David Ricardo, who flourished in the London markets from the 1790s until about 1818. A large trader in Consols (bonds) and stocks, he accumulated a large fortune from his speculations, which afforded him the leisure to focus on his primary interest in life, economics. Exactly what his methodologies were is not known, but it is to him that one of the most famous sayings in all of trading history is attributed: “Cut short your losses; let your profits run on.”1 This is good advice, no doubt – it has survived to the present time and is expressed often. Still, there is no detail here, no advice on how to cut losses or how to let profits run on. And while the first part of the maxim says something about some liquidations, nothing is said about initiations. The ending part, however, is a clear exposition of a central tenet of trend following philosophy: as long as the trade is going your way, don’t get out. This last quote is from Edwin Lefèvre’s Reminiscences of a Stock Operator, a series of articles from the Saturday Evening Post in 1922 – 23, reprinted in book form many times. Although the speaker is stated to be Larry Livingston, it is generally agreed, based on known biographical information, that Lefèvre’s interviewee was Jesse Livermore. The quotation, in turn, is Livermore’s interpretation of an oft-repeated statement made by “Old Partridge”, a brokerage-house acquaintance of Livermore’s, that “It’s a bull market, you know.” This advice was given whenever some trader was tempted to liquidate a winning position too soon, and was not always well regarded. To Livermore, however, the advice finally sank in, yielding the analysis above, and, it would seem, changing his trading style, if not permanently, at least in his periods of trading well. (Livermore, it must be remembered, experienced many losing spells in his career.) Old Partridge, alas, though we would like to know a lot more about him, must remain a mystery. How did he initiate his positions? How did he liquidate? We will probably never know. At any rate, the advice from the above traders is not about initiations or liquidations; rather, it is about when not to liquidate. The counsel is good, but not complete. Indeed, if we can precisely define our initiations and liquidations, the advice “stay with the trend” becomes irrelevant. It happens automatically. So if true trend following must include well defined initiations and liquidations, can we conclude that the historically well-known traders of the past were trend followers in a full sense? What can be said about the initiation and liquidation strategies of these traders? Similar things can be said about the famous Wall Street traders of the same and later periods. They, too, dealt with the fundamental economic forces of the times – canals, railroads, mining, industry and banking – but they were schemers and manipulators as well, with their pools, publicity campaigns, bear raids, watering of stock, etc. Their initiations were often complicated affairs, but generally the final success of their intrigues depended upon some adherence to broad economic fundamentals. The well-known grain traders in later 19th century Chicago, too, made their initiations largely by considering fundamental factors, although it must be said that much of this fundamental knowledge was of a local character, i.e., relating to warehouse stocks, local transportation capacities, and local growing conditions. Further, the mid-to-late 1800s were the classic period of the “corner”, whereby large operators were able to gain control over local stocks to such a degree as to be able to name their own price when they chose to liquidate. So the “fundamentals” were in many cases artificially created: most tradable grain stocks were “locked up” in warehouses controlled by the cornering operators. Marginal stocks were few. By the late 1800s and early 1900s, however, improvements in communication, transportation and storage capabilities – as well as more regulation — had changed the dynamics of the markets to such a degree as to make corners harder to accomplish. Joseph Leiter’s attempted wheat corner of 1897 – 98, for example, was broken by P. D. Armour’s ability to move 6,000,000 bushels of wheat to Chicago warehouses in the middle of winter.5 Corners were still attempted, of course, and some were successful. But these corners had to be more sophisticated, and be based on a broader, worldwide fundamental perspective. James A. Patten was perhaps the foremost example of this type of fundamentalist, having agricultural correspondents not only in all sectors of the United States, but also in Europe and South America; his 1909 wheat corner, based, he claimed, on fundamental information much of which was available to all, was successful.6 It was, however, not a pure corner in the sense of Patten having had control of all, or nearly all, deliverable supplies. There were lots of other longs, or, shall we say, “trend followers”. And what of liquidation? How were the massive positions of those who had cornered the markets liquidated? In the earlier days, there was a common protocol: invite your opponents to your office and settle on a price. The wheat corner of 1867 was a good example of this. Benjamin P. Hutchinson – “Old Hutch” –, the most notable Chicago speculator of his era, having purchased a million or more bushels of wheat and stored it in his warehouses, and having gone long equally large numbers of contracts for wheat, placed the “shorts” in a position such that they could not deliver the wheat their contracts had obligated them to do. So the shorts came to Hutch’s office, negotiated, and settled for $2.85 a bushel – an enormously high price for the time. Immediately thereafter wheat prices plunged – by 90 cents within a day. Any trend followers would have had to be swift if they were to capture the same level of profit Old Hutch did, though Hutch had his own problem – how to dispose of the “corpse”, that is, the physical wheat in his warehouses.7 Presumably, however, this wheat had been purchased at much lower prices, and as long as there was true demand, the wheat could be disposed of at a profit. The more fundamentalist Patten, in 1909, knowing that there was going to be a wheat shortage following his settlement with the shorts, sold his surplus with ease. So while the big operators of the past believed in staying with the trend, they were not fully “trend followers” as we would understand the term today. But that there was some sort of trend following going on during the period we know, for if Benjamin Hutchinson was buying, the rallying cry “Hutch is buying” came not long afterward, and the trend followers began buying as well. And in the early 1900s, the question on everyone’s mind was “What are the trusts (or pools, or rings) doing?” and whatever it was that they were doing, the trend followers did the same. This was not very scientific trend following to be sure, but trend following nonetheless. These behaviors reinforce the idea that trend following is of a humble, plebeian origin. It is a means by which those who are not members of the economic elite may participate in trading profits by following the transactions of this elite as they act on the basis of their economic intelligence, or conversely, as I would argue, their arrogance and folly. Prior to the mid 19th century, speculation seems to have been largely the province of the elite, and a small coterie of early, but still semi-elite, trend followers. The larger public’s participation was primarily as trend followers in the lower sense, taking part in one or another of the “bubbles” that permeated the financial scene from time to time, helping to precipitate the panics that occurred regularly during the period. But the next half-century and beyond saw the growth of a much larger pool of market participants, as well as some fundamental changes in thinking and procedures. According to William Fowler, in his book Ten Years in Wall Street (written in 1870), the key year was 1862, “when began the greatest era of speculation the world has ever seen,”8 while “Uncle Sam’s presses were printing greenbacks by the million”. 9 To be sure, some price movements in stocks and commodities during this era were breathtaking: in addition to the grain corners previously mentioned, there was the “gold pool” of 1869, as well as regular bull runs in numerous railroad stocks, the Harlem being a notable example. The importance of Fowler to our knowledge is that he was not just a writer; he was a participant. He knew the major traders of the day personally, and participated in many of the market movements of the day himself. Finally we have an extensive and meaningful narrative concerning speculation and the workings of the markets during a very formative period. And Fowler was not the only author to come out with an exposé in the year 1870. There was also Matthew Hale Smith, with his Twenty Years among the Bulls and Bears of Wall Street, and James K. Medbery’s Men and Mysteries of Wall Street. Remarkably, within the space of a year, the genre of “Wall Street memoir”, scarcely existent before, had grown exponentially, and where before there had been a scarcity of information now there was plethora. We should include, of course, Henry Clews’ somewhat later works: Twenty-eight Years in Wall Street, The Wall Street Point of View and Fifty Years in Wall Street, to name but a few. And let us not neglect Dickson Watts’ 1891 essay Speculation as a Fine Art — very general in its advice, but the work of an experienced trader nonetheless. As might be expected, Fowler, Smith and the others focus mostly on the major traders of their day, not the lesser ones. And again, it seems that the game was one of manipulations, pools, rings and corners – but usually on the basis of some fundamental foundation. Vanderbilt and Gould actually ran the railroads that they controlled, so it was not purely their goal to drive share prices up and down ad infinitum, to profit on the fluctuations; there was real economic activity involved, too. But in other cases, it must be admitted, speculation was undertaken for profit only. Good advice, perhaps. But the problem was actually greater. Rather than “old men”, it was the rings and pools that more often began major market moves. How could one tell when a pool had started buying? Or had begun selling? These questions had no real fundamental answer, or at least none that was accessible to the average small trader in these markets. To be sure, there were newspapers, but how was one to know the truth of what was being reported? Even if there was no outright disinformation, surely the big speculators did not telegraph their intents so easily. They rather tried to hide their buying and selling. So for the small trader the question was a technical one, to be answered by observing who was doing the buying and selling — to whatever extent that was possible — or by watching the price action of the stock itself, and the volume. And so I would argue that the technical approach to trading, including trend following, came about not by design, but by necessity. Speculation in the 19th century was, it would appear, rich in practice but poor in theory. What was needed was an approach that could step back from the fray, observe the actions of the marketplace from an objective distance, and contemplate the nature of price fluctuations and swings over the period of days, months, and years. Were there meaningful patterns hiding in the ebb and flow of prices? Could knowledge of these patterns be the basis for trading the markets? Was there a theory that might provide structural, systematic underpinnings for a true trend following model? In fact, such a model was being developed, if incompletely, as the century was drawing to a close. The model was called Dow Theory, based on concepts originated by Charles H. Dow in a series of articles in the Wall Street Journal between 1899 and 1902, expanded upon by William Hamilton between 1903 and 1929, and refined by Robert Rhea in 1932. Inasmuch as Dow Theory defines a bull market as a series of higher highs, and a bear market as a series of lower lows, the rudiments of a trend following strategy become apparent: one buys on the breakout of an old high, and sells on the breakout of an old low. Of course, there are further rules dealing with confirmation and volume, but as a bare bones system, the above will suffice (recognizing, of course, that the methodology can be applied to individual equities and commodities as well as “averages”). The Dow Theory is, I believe, the earliest modern expression of an objective trend following system, inasmuch as it defines precisely — as long as one can define precisely what constitutes a meaningful high or low — the entry and exit levels for trend following trades. Further, the methodology can be generalized and parameterized: different levels of breakouts can be used, moving averages of prices can be used, etc. Dow Theory is certainly the grandfather of trend following methodologies; indeed, one can argue that subsequent methodologies are mere refinements of it. Dow Theory itself is not very mathematical; rather, it makes logical observations about current and past prices to determine the direction of the market. This innumeracy is not surprising, since the theory was developed long before the advent of the computer. Nor is it surprising that the earliest offshoots of Dow Theory continued in this observational, structural mode of analysis. Robert Prechter, for example, states that R. N. Elliott developed his wave methodology through contemplation of Dow theory.12 Richard W. Schabacker, Robert D. Edwards, and John Magee also recognized Dow theory as seminal to their thinking, with Edwards and Magee’s book Technical Analysis of Stock Trends, for example, devoting three chapters to the subject. Indeed, Technical Analysis of Stock Trends, first printed in 1948, as well as its predecessors, Schabacker’s Technical Analysis and Stock Market Profits, from 1932, and Profits in the Stock Market, by Harold M. Gartley in 1935, are milestones in the development of trend following methodology. Given the focus in these books on technical patterns such as flags, pennants, triangles, head-and-shoulders patterns, etc., it may seem peculiar to associate these books with trend following, but the point behind being able to distinguish such patterns is precisely to recognize signals for trend beginnings, continuations, and ends. To quote from Edwards: “Profits are made by capitalizing on up or down trends, by following them until they are reversed.”13 Aha! There we see the terms “trends” and “following” separated by only the space of a word, suggestive of an underlying trading philosophy supporting the myriad of details. A basic trend following tool of Schabacker, Gartley, Edwards and Magee’s was the trendline, a line connecting the “basing points”, or minor tops or bottoms (in terms of Dow theory), with each other. Buying and selling signals were based (with further conditions, exceptions, etc.) on the “breaking” of these trendlines – a modification of the more basic Dow idea of a breakout from the price level defined by the top or bottom itself. From Schabacker: “So trend lines serve a double purpose. While they last they define the line of continuation in a movement, and when they are broken they serve notice of a probable reversal and advise us to forget the old lines and start searching for new ones to define the new trend.”14 The virtue of this methodology was, of course, an earlier potential identification of trend changes. The disadvantage was a greater possibility of whipsawing. Now the question must be asked, to what extent were Schabacker, Edwards and Magee innovators of these trading strategies, and to what extent were they merely describing methodologies that were already in use among traders of their time? A clue is revealed by Edwards, who states “Your experienced technician, in fact, is constantly drawing trendlines of all sorts…”15 thereby implying that trendlines had been used by other traders prior to the authorship of his book (though not necessarily Schabacker’s). Indeed, the idea of connecting points on a graph is so basic that one presumes it might have been done for as long as there have been graphs. There may, in fact, be an element of self-fulfilling prophecy in the response of the markets to reaching the trendlines thereby formed, since the lines represent areas of support or resistance expected to hold by observers. Three other books should be mentioned at this point – earlier books by a few years than the above mentioned ones. The first book, published in 1928, was Stock Movements and Speculation by Frederic Drew Bond. Like other writers of his time, Bond wrote about basic price patterns such as double tops and bottoms, and repeatedly discussed the nature of trends, and how “…the public do not make the trend of the market. They follow it.”16 (Again, note the words “trend” and “follow” in close proximity.) Who, then, makes trends? Well, that would be “…plainly the great industrial, commercial and financial capitalists of America,” “who correctly anticipate the future at least in a general broad way.”17 In other words, as discussed above, trends are created by those who are most directly aware of the fundamental factors influencing the economy, or, in some cases, those who create those fundamentals. The second book, by William D. Gann, entitled Truth of the Stock Tape, first published in 1923, also emphasizes the trend: “The way to make money is to determine the trend and then follow it.”18 Indeed, the focus in this book, and other works of Gann’s that followed, was, in one way or another, to take trades in the direction of the market’s trend. Perhaps to the surprise of some, Truth of the Stock Tape is a very conventional work, given Gann’s later reputation for esotericism and astrology. Of course, the methodology suggested by Wyckoff can now routinely be done on an iterative basis by computer. Not one, but millions of tests can be done with a rapidity that would have astonished Wyckoff. But would his judgment have changed? Possibly, since we know that many years later, Wyckoff was using charts to draw trendlines, or as he called them, supply lines and demand lines, depending upon whether these lines connected high or low points. Note that the verb “follow” has become the present participle “following” — an important conceptual necessity (though not the final one), I believe, in solidifying the idea of trend following as a continuing or recurring action. Central to Livermore’s philosophy was the recording of “pivotal points”, or intermediate highs and lows. These “pivotal points” were in part the same thing as Dow Theory intermediate highs and lows, or Edwards and Magee’s “basing points.” Initiation and liquidation signals were based on significant movement away from these pivotal points — either three or six points, depending upon the type of rally or reaction that was being considered, for a stock selling above $30. Thus, Livermore’s formula was not a breakout system, nor a trendline system, but rather a type of “filter rule”, though a bit more complicated than the typically tested sort. The parameters used were arbitrary, but according to Livermore, based on much experience. Today we would undoubtedly optimize these parameters by computer. Livermore’s method certainly has some appeal, but one cannot help thinking that it might have been better understood and traded if it were chart based. But Livermore was not a chartist: “Personally, charts have never appealed to me. I think they are altogether too confusing.”25 Most people, I think, would disagree. It is notable that Jones uses the exact terms “trend followers” and “trendfollowing” in his article. But the meaning of the words perhaps differs from our usage today. For example, when he states that “what [Mills] and Lowry have are still trendfollowing tools, with all their advantages and limitations,” he seems to mean something more like “trend-lagging” – such as when a moving average turns higher after a trend has already begun. In other words, trend following was not yet a fully formed concept. “Trend” was not yet a noun adjunct, nor “following” a gerund. The individual who finally made the connection was perhaps William Dunnigan, a trader, technical analyst, and writer who ran a business cycle forecasting company in Palo Alto, California in the 1950s. Dunnigan had many books and other publications to his credit, beginning with the very academic Forecasting the Monthly Movement of Stock Prices in 1930, and following with a more technically oriented, mimeographed publication called Trading With the Trend in 1934, to name but a few. His major works, however, came out in the early and mid 50s. Dunnigan is perhaps best known today for his “thrust” methodologies and “oneway” system; but his overall market perceptions were broad and deep. He had a knack for verbal innovation, including the invention of terms such as “trap forecasting” and “continuous forecasting”, used to distinguish between those trades designed to capture quick profits (“catching the market in a trap”) and those with an indefinite duration whose exit levels were determined on a day-to-day basis, depending on market action. And so with Dunnigan and Donchian we come to an end. Although these two were by no means the first trend followers, nor surely the last, they were truly a watershed in the history of trend following. While many of the ideas that preceded theirs were trend following in nature, they were largely inchoate, with an unstated or incomplete underlying philosophy. Dunnigan and Donchian, however, articulated this philosophy – indeed, called it trend following — and thereby laid a foundation upon which later methodologies could comfortably rest. The narrative continues, of course, but since it has already been well and amply covered, I will stop at this point. Suffice it to say, however, that we remain under the influence of these pioneers of trend following, whether we know it or not. 1 James Grant, The Great Metropolis: second series volume II (London, 1837), p. 81. 2 Arthur W. Cutten, “The Story of a Speculator,” Saturday Evening Post (December 3, 1932), p.13. 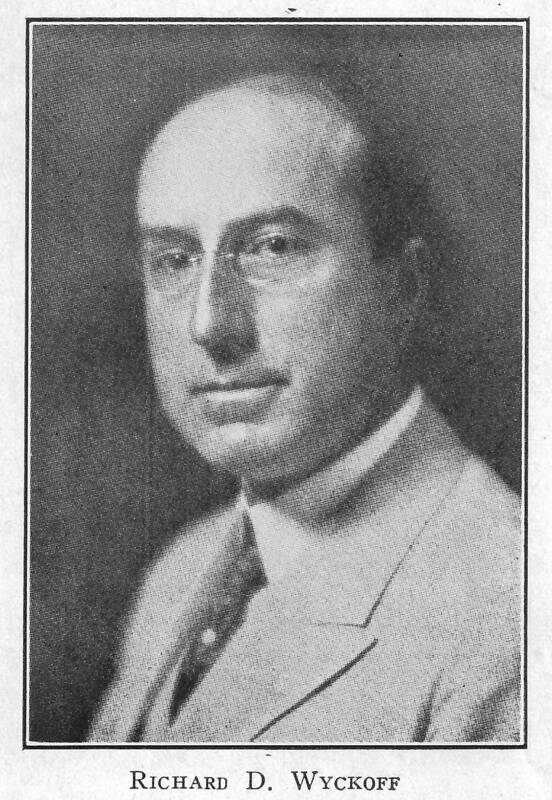 3 Edwin Lefèvre, Reminiscences of a Stock Operator (Garden City, New York, 1923), p.54. 5 Peter Tracy Dondlinger, The Book of Wheat (New York, 1908), p 253. 6 James A, Patten, “In the Wheat Pit,” Saturday Evening Post (September 3, 1927), pp 3- 4. 8 William Worthington Fowler, Ten Years in Wall Street (Hartford, CT, 1870), p. 36. 11 Henry Clews, Twenty-eight Years in Wall Street (New York, 1888), p. 20. 12 Robert R. Prechter, Jr., R. N. Elliott’s Masterworks: The Definitive Collection(New Classics Library, 1994) p. 50. 13 Robert D. Edwards and John Magee, Technical Analysis of Stock Trends 5th edition (Boston, 1966), p. 234. 14 Richard W. Schabacker, Technical Analysis and Stock Market Profits (Harriman House, 2005), p. 269. 15 Edwards and Magee, p. 250. 16 Frederic Drew Bond, Stock Movements and Speculation (New York, 1928), p. 25. 18 William D. Gann, Truth of the Stock Tape (New York, 1930), p. 33. 19 Richard D. Wyckoff, Studies in Tape Reading (New York, 1910), p. 7. 20 Richard D. Wyckoff, Stock Market Technique Number 2 (Fraser Publishing Company, 1989, reprint of 1934 edition), p. 197. 21 Studies in Tape Reading., p. 131. 24 Jesse Livermore, How to Trade in Stocks (New York, 1940), p. 20. 26 Alfred E. Cowles III and Herbert E. Jones, “Some a Posteriori Probabilities in Stock Market Actions”, Econometrica (July, 1937), p. 286. 27 Alfred Winslow Jones, “Fashions in Forecasting”, Fortune (March, 1949), p. 180. 28 William Dunnigan, New Blueprints for Gains in Stocks and One-way Formula for Trading in Stocks and Commodities (Harriman House Limited, 2005, reprint of 1954 and 1956 editions), p. 31. 30 Elmer Clark Bratt, Business Cycles and Forecasting, fourth edition (Homewood, Illinois, 1953). p 497. 31 Richard D. Donchian, “Trend-Following Methods In Commodity Price Analysis”, Commodity Year Book (1957), p. 35. 32 William Baldwin, “Rugs to Riches”, Forbes (March 1, 1982), p. 143. 33 Darrell Jobman, “Richard Donchian: Pioneer of Trend-Trading”, Commodities (September, 1980), p. 42.